Bryan Brayboy, co-director of ASU's Center for Indian Education and associate professor of culture, society and education in the School of Social Transformation, commented on some of the challenges American Indian/Alaska Native students face on college campuses, as part of a story on one California university's efforts to bring Native students into language preservation projects and improve college graduation rates. 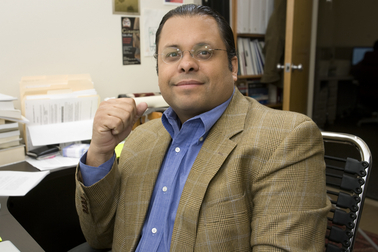 "Getting students to feel more comfortable with an institution and see how their education can allow them to help their tribes will improve college completion rates," said Brayboy, who is recognized nationally for his expertise in equity and diversity and his research on the experiences of American Indian students, staff and faculty on college campuses. "If students haven't spent a lot of time on campus, they're less likely to know how to navigate the institution," he also noted. "Other challenges that American Indian college students face include a lack of role models, financing and academic preparation," said Brayboy, a member of the Lumbee Nation. "American Indian students are more likely to graduate when they believe what they've gained can be used to benefit their communities." The 2011 issue of Diverse: Issues in Higher Education, which annually ranks the top 100 degree producers in both undergraduate and graduate programs, recognized Arizona State University as sixth in the nation in Native American bachelor's degree graduates and first in the nation in Native American doctoral graduates in all disciplines and in education specifically.